It’s a gorgeous day in Sydney and I find myself with founder of Wok On Inn and with the two lovely ladies from 6DC PR (Sara and Julie). All have accompanied me to show off Wok On Inn’s latest venue at the Rocks, tucked away just a hop, skip and away from the Lowenbrau. I have to admit I’m feeling quite inspired when I meet Ankur Sehgal, founder and owner of the Wok On Inn franchise. He shares with me his vision and what sets Wok On Inn apart. “It’s all about dishing up street food that’s authentic, bold and affordable”, he says. Wok On Inn is just like any street food you would find back in Asia. There’s no MSG, meat is chemical free or grass fed and they pride themselves on using the freshest highest quality ingredients. 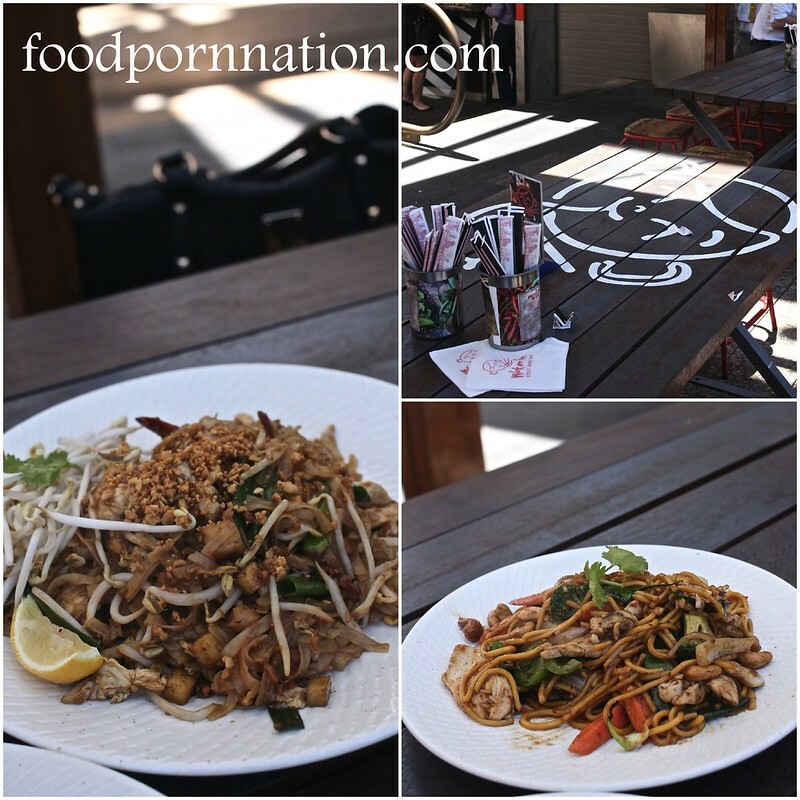 It is about being as real as it comes, with its hawker stands, outdoor communal seating and help-it-yourself cutlery. What makes it even better is that Wok On Inn represents 8 different flavours across 8 different regions. That’s Chinese, Thai, Indonesian, Malaysian, Singaporean, Mongolian & Korean. Ankur (Owner) has also made every effort to preserve each origins inherent traditional flavours by going in so far as to create their very own authentic Asian sauces from each country of origin. All made with locally sourced ingredients. We order three dishes to share. The Pad Thai, Bangkok Noodles and Uncle’s Drunken Noodles ($12.95 each) but during lunch this is ($9.95 ) with a can of drink/water but even at full prices it is still much cheaper than my local! Just when Dixon st couldn’t get any better it graces us with a delicious Hong Kong style eatery serving up Cantonese food in a casual ‘dai pai dong‘ setting. 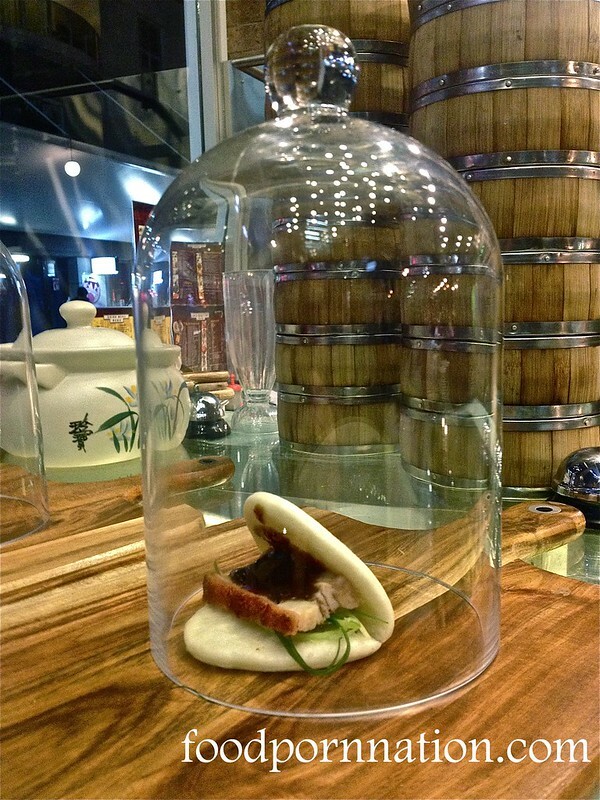 It’s hard not get too excited while you wait outside with the pork bun enshrined capsules, glistening BBQ ducks and live seafood tanks looking sweetly at you. 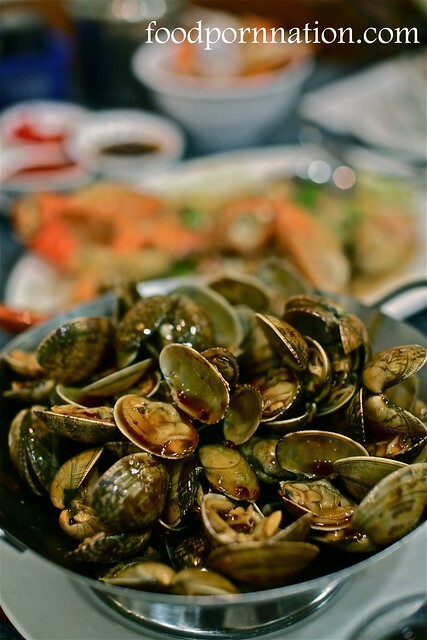 Old Town Hong Kong Cuisine has a great mix of value and deliciousness. 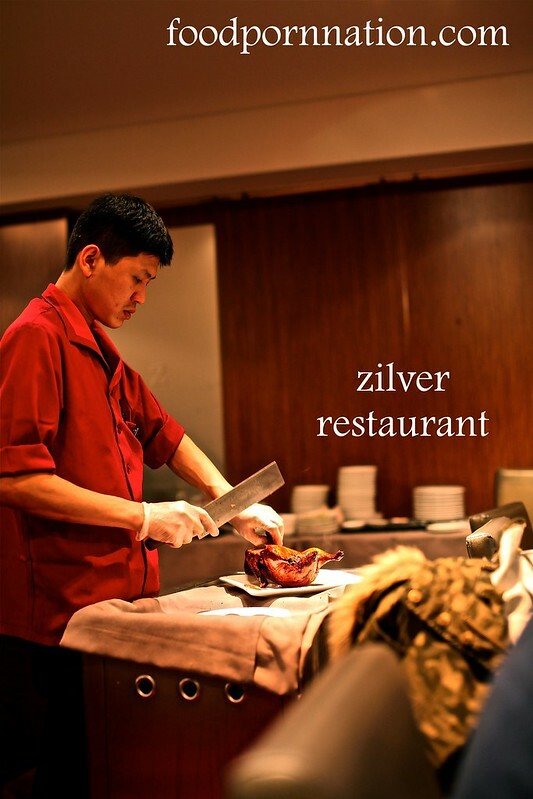 Atmosphere is buzzy, service incredibly warm and friendly. I’m just so used to it hard and fast, so I’m a little dumbfounded at how pleasant it all is. What’s hot on everyone’s lips? The baos of course. 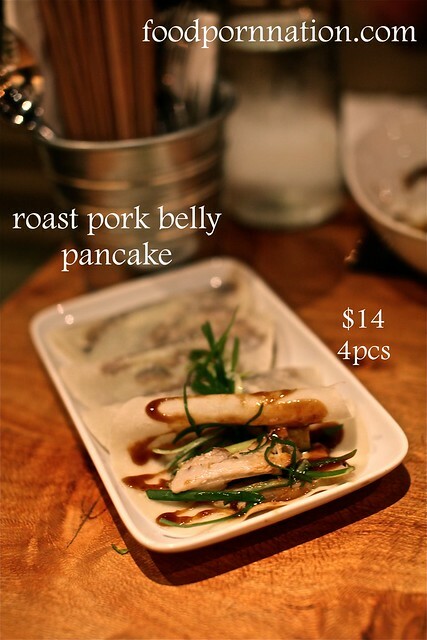 With their variety of char siu ($7 for two), pork (siu yuk – $8) or Peking duck ($8). 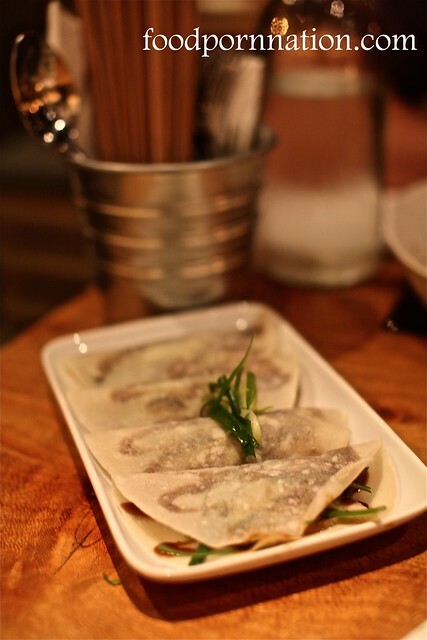 In fact, Old Hong Kong Town appears to be one of the better places serving up value for money Peking duck – half duck ($35) or whole duck ($65) with a second course of san choi bao. Decked out over 4 floors of incredible space, the interior will take you into a wonderland of graffiti walls, neon lights and communal dining space with the help-yourself-arrangement of cutlery, chopsticks, hot sauce and seasonings. Awarded a one hat out of a possible three, it is respectively the most unconventional and deviant one hatter on the scene. It is all very tongue in cheek hailing tribute to the MSG code with the flashing “six two one” neon sign out front, or perhaps it’s the thought behind their signature dessert “stoner’s delight”. The secret ingredient? The mind of a stoner. Fun and games continue with their slushie bubble tea cocktails. Cute caricatures are printed on the seal, with mouths wide open urging you to pop your straw and drink up. For Sunday lunch, Ms G’s offers up a lunch menu at a fraction of the price – the “tick the box” menu for $45p/p. Ticking my way through the menu we are allowed to pick 2 starters, 2 small savoury dishes, 2 large savoury dishes and one dessert. Then enough food is brought out based on our per person count. Slushie Sundays also brings the price down of the bubble tea cocktails to 5 big ones instead of the usual $14. Note: all prices quoted below are the al la carte prices. The easiest way is to ask your fish monger to slice the crab into quarters for you, which is what I do. This totally beats having to do this yourself. Also ask them to crack the claws. This ensures that the heat seeps through the claws to even out the cooking time. You will need to cut the the legs (little legs of four) on each side in half. This will ensure everything cooks consistently. Remove the deadman’s fingers/gills and digestive tract. Or you can leave the mustards, if you prefer. Chinese NYE is always spent with family/friends gorging on copious amounts of food to ring in the new year. Kind of what I like to think of as a Chinese version of Christmas! You have your traditional items served at dinner to symbolise good luck, good health and prosperity. On the night, you must have chicken and fish, to symbolise prosperity and long uncut noodles as a symbol of longevity/long life. With a small gathering of four, I thought I would do a quick post of what I served up last night. 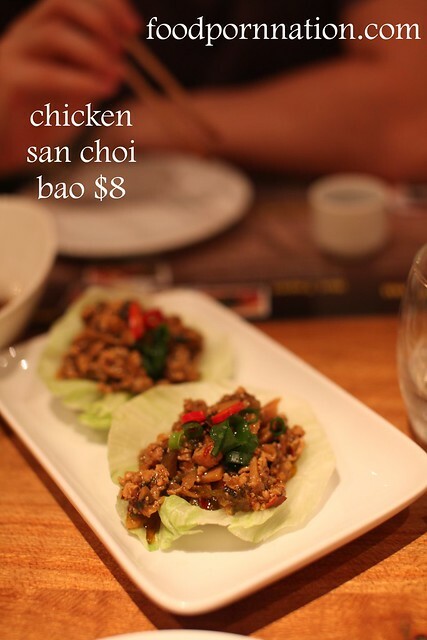 Firstly, we tucked into some soy chicken. Chicken should be served whole to symbolise family wholeness and completeness. 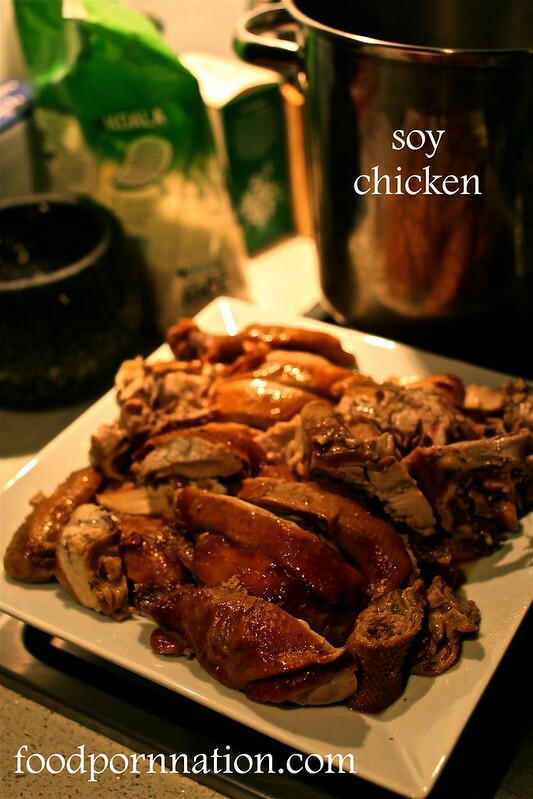 I bought this soy chicken from Emperor’s Garden BBQ and I think it is one of the best Chinese BBQ places you can find. The chicken is deliciously salty and sweet. The flesh is tender and moistened with a touch of sweet soy that seeps to the bottom which I tend to reuse for basting. 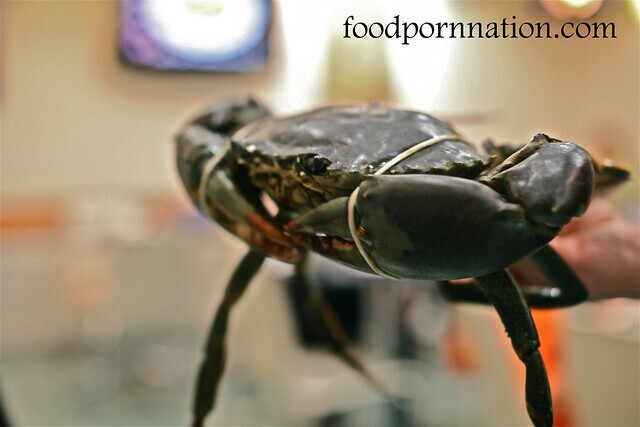 I managed to prepare 3 kilos of mud crab with a lot of blood sweat and tears. I served it up with egg noodles and a ginger and shallot sauce.This was my first time serving it up and I have to say, I was pleasantly surprised on the results, that I just have to share the recipe! Click here to take a look. I just loved how the noodles slurp up the sauce! Lastly, I steamed a whole snapper with ginger and shallot sauce which is a very popular and traditional way of serving fish. 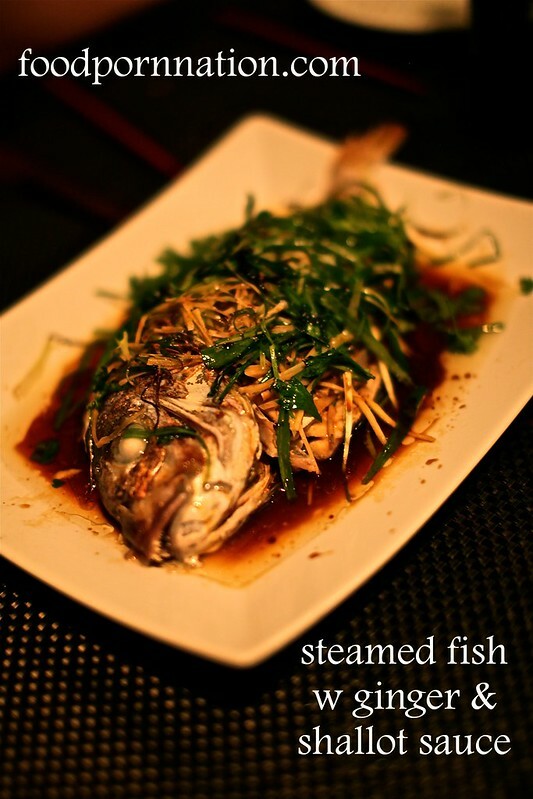 Eating fish symbolises abundance and excess for the year (年年有餘, niánnián yǒu yú) and again must be served whole from head to tail to signify a good start and finish for the year ahead. Welcome to the Year of the Snake 2013, Kung Hei Fat Choi! Super Bowl is a personal favourite of mine. 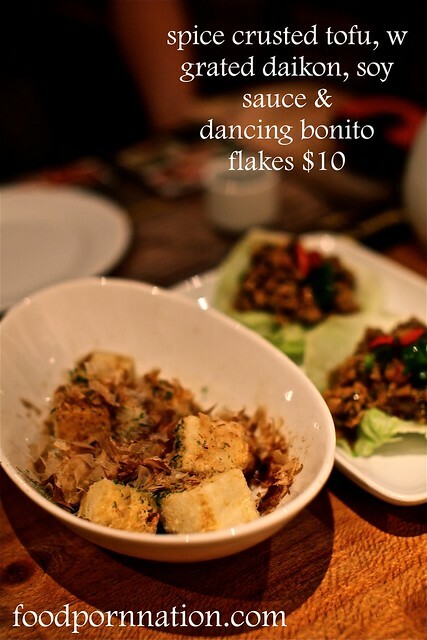 Food is always delicious, cheap and served to you in your traditional Hong Kong (Honkie) style eatery. You have communal seating with plastic chairs, food served and moving at warped speed while patrons are merrily burping and slurping away. Hong Kong, eat your heart out. 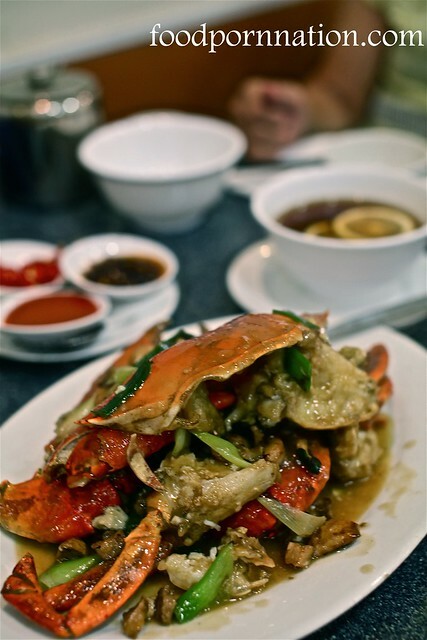 Here you can find mud crab w ginger and shallot sauce, a traditional Chinese favourite. 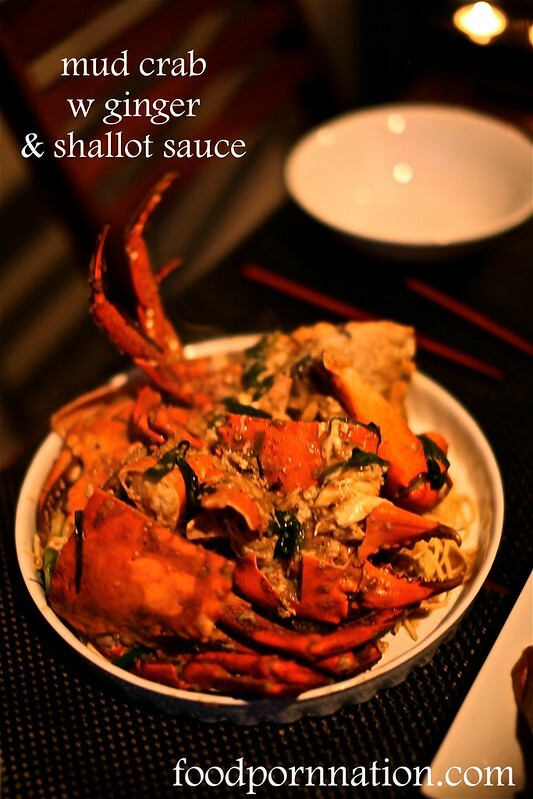 The crab is sweet, fleshy and cooked to perfection. And the sauce is simply out of this world. It will have you double dipping and spooning for more. 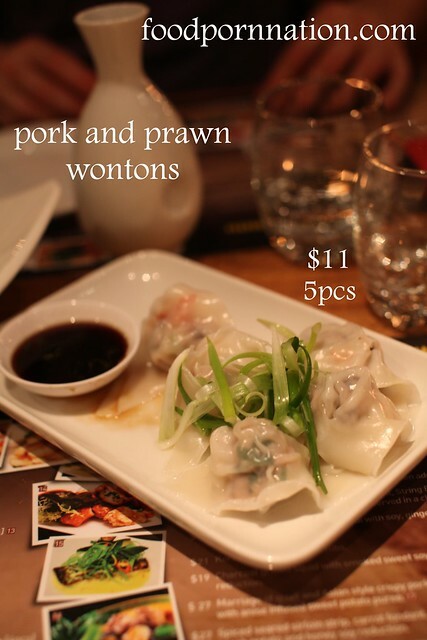 New Shanghai Chatswood Chase, Delicious dumplings? With the vote of confidence from some trusted fellow bloggers and co-workers alike. New Shanghai was rumoured to have really good dumplings on offer. Brazil and I began our night with an order of the sweet and sour pork ribs with dark vinegar sauce. 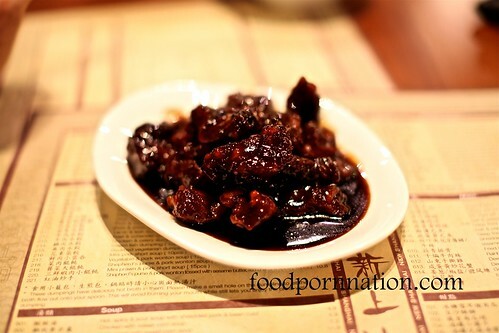 A step away from the original sweet and sour version we have all come to know and love or hate, the pork ribs sat covered in the glossy sticky sauce that had a strong sour vinegar flavour as opposed to the balance of both contrasts. The ribs were served cold and despite the taste I couldn’t help but long for a piping hot serve of sticky pork ribs.